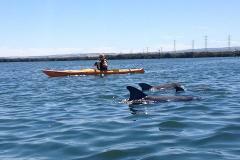 This is a 2 hour course introducing you to the basic techniques and safety aspects of having fun in your kayak on lakes, slow moving rivers and calm coastal areas. Our school programs are customised to suit the outcomes of the schools curriculum. These can be focussed on skill learning, environmental studies, group challenges, tourism, preparation for expeditions. Call us to design your course NOW! 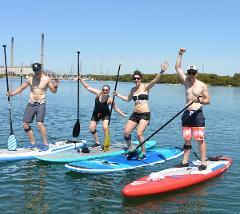 Stand Up Paddle Boarding(SUP) is all the rage. Try it at the Dolphin Sanctuary. Your guide will lead you through the basic skills and then take you on a tour of this spectacular environment. Private & small group tours available.